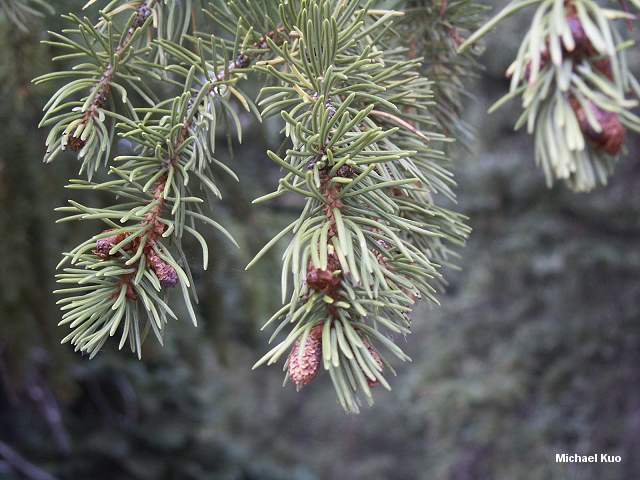 Four-sided, blue-green, flexible needles that leave pegs when they fall; reddish brown, thin and scaly bark; cones less than 2.5 inches long; growing in western mountains. 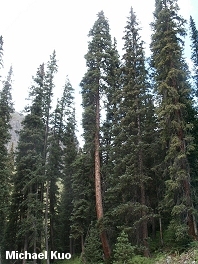 Habitat: At lower elevations in the northern Rocky Mountains, and at higher elevations in the southern Rockies; in pure stands or mixed with other conifers (often with subalpine fir). Stature: 60-120 feet high; to 3 feet in diameter; narrowly pyramid-shaped; scraggly; branches short, whorled. 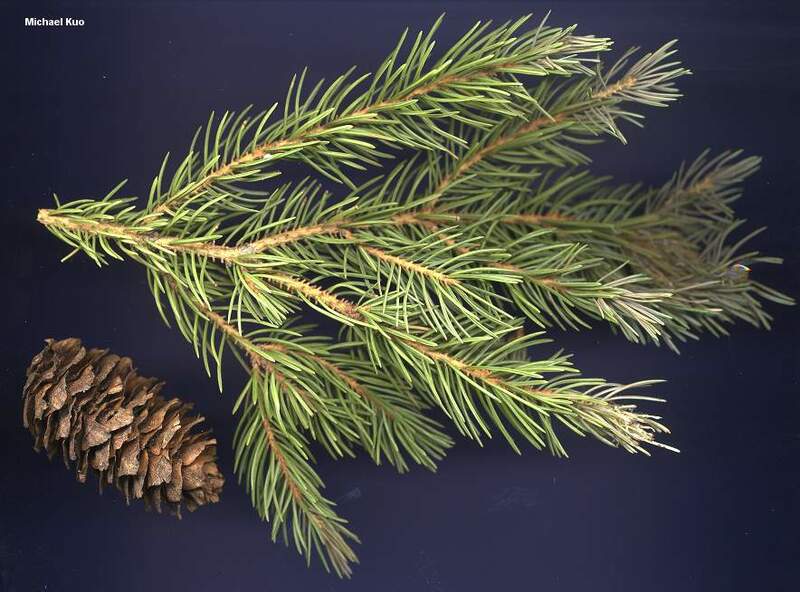 Needles: 1 inch long; blue-green; four-sided; fairly flexible and not very sharp. 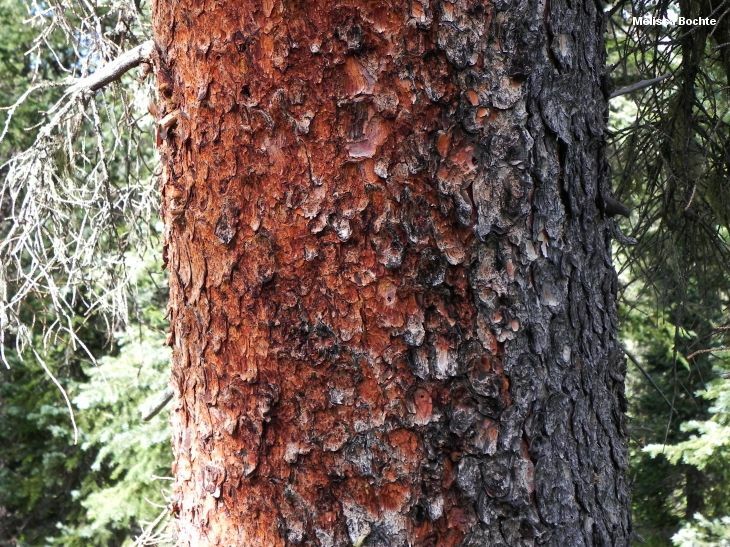 Bark: Thin; loosely scaly; distinctively reddish. Cones: 1-2.5 inches; scales flexible; bud scales appressed; persisting up to one year before falling in fall or winter. Many, many mushrooms are associated with Engelmann spruce, either in mycorrhizal partnership or as saprobic decomposers of Engelmann spruce litter and wood. A partial list includes: Agaricus amicosus; Albatrellus confluens; Albatrellus ovinus; Amanita muscaria var. flavivolvata; Boletus rubriceps; Calocybe onychina; Cantharellus cibarius var. roseocanus; Catathelasma imperiale; Clavariadelphus lignicola; Clitocybe albirhiza; Cortinaius elegantio-montanus; Cortinarius pinguis; Floccularia fusca; Fomitopsis rosea; Hygrophorus olivaceoalbus; Hygrophorus pudorinus; Hygrophorus purpurascens; Lactarius badiosanguineus; Lactarius caespitosus; Lactarius deliciosus var. areolatus; Lactarius repraesentaneus; Leccinum species; Lepiota clypeolaria; Pycnoporellus alboluteus; Sarcodon imbricatus; Tricholoma equestre; and many others.